I wrote previously about scheduling a Spring Batch application from Oddjob. Here I’ll demonstrate how to pass the scheduled date, as a parameter, from Oddjob to Spring Batch. Passing a parameter to our wrapped Spring Batch application needs a few lines of code – but not many. OK – so I’ve also done some other things. 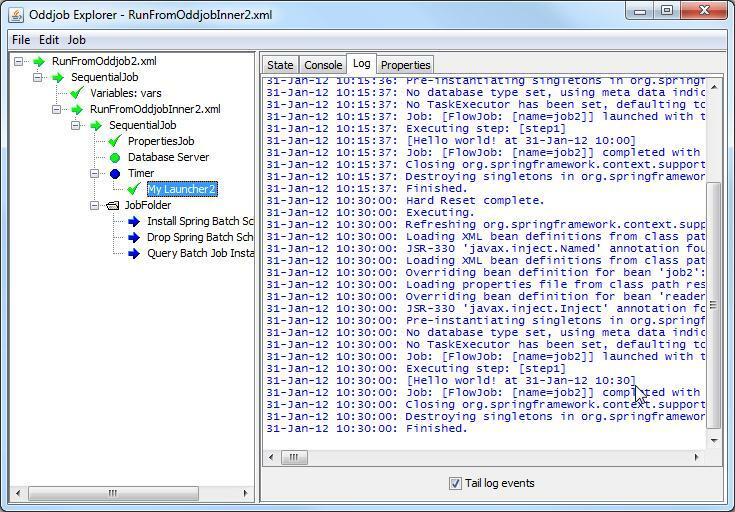 I’ve removed the HSQL embedded database from the Spring Batch Project and used Oddjob’s own HSQL plugin instead. This allows the database to be available between runs as would be the case for a real world deployment. I’ve also collected together some utility jobs in the JobFolder. These won’t run automatically but are handy to be manually run when required – this is how I installed the Spring Batch schema. And that’s pretty much it. All the source code and Oddjob configuration are in the Oddjob Oddments Directory on Sourceforge. This entry was posted in Oddjob, Spring Batch and tagged oddjob, Spring Batch by rob. Bookmark the permalink.